When you are ready to purchase new blinds or shades, you can save time if you know how you are going to operate your window treatments. Not all blinds or shades operate the same. So ask yourself, “Are you a tilter or a lifter?” Our sales consultants at Treasure Coast Window Fashions, a Hunter Douglas Gallery dealer serving the West Palm Beach area, can show you window treatments options that will match your preferred style. Tilt blinds for light and privacy. If you are primarily a “tilter,” you are someone who wants to leave your window treatments in place and just rotate them open and closed. 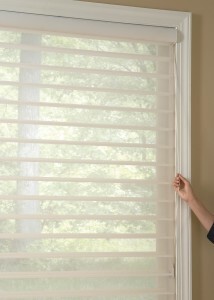 Tilting blinds and shades gives you privacy while allowing in natural light. Lift shades for maximum energy efficiency. Whether you’re a “tilter” or “lifter,” come by our showroom to see our wide variety of Hunter Douglas window fashions. Treasure Coast Window Fashions provides more than just the finest window coverings. Our owners are involved in every project from start to finish to ensure your window covering project exceeds your expectations. We’re proud to serve the greater West Palm Beach area. Please contact us at 772-220-8870 or visit our showroom in Stuart, FL, for more information about our products and services. Contact us to learn more. Choosing New Window Coverings – Tilt or Lift?